Young parents often worry about the early stage brain development of their children, often due to societal pressure or sometimes comparing their kids with other bright children of the same age-group. Usually, Indian parents take stress seeing their kids spend more time in front of idiot box or engaged on hi-tech gadgets. To end all the unwanted worries of Indian parents, Delhi-based innovative startup has come-up with an exclusive WonderBoxx for creative children to learn while playing. It is innovative, theme-based and age-specific, hands-on learning tool which could be subscribed on monthly basis, to encourage kids to explore their imagination and learn things while playing. With the help of hands-on inquiry, they can become lifelong learners. WonderBoxx is the brainchild of IIT Kanpur alumnus Deepanshu Arora and Parita Parekh, an alumnus of Brown University, backed by a team of pedagogy experts, product designers, children authors, illustrators and young parents. “Kids these days spend a lot of their time either on television, smartphones or on tablets and do not really take interest in learning activities. So we thought, if we can create something that could teach them while playing will be really helpful and would also add value to their creative skill. So, that was the idea behind developing WonderBoxx. It is an inimitable product which will help them learn while playing,” says Deepanshu Arora, Co- founder and CEO, WonderBoxx. The product not only enables the child to create a home lab, weave-in their creative ideas, lead hands-on inquiry, but will also develop their culture of knowledge. 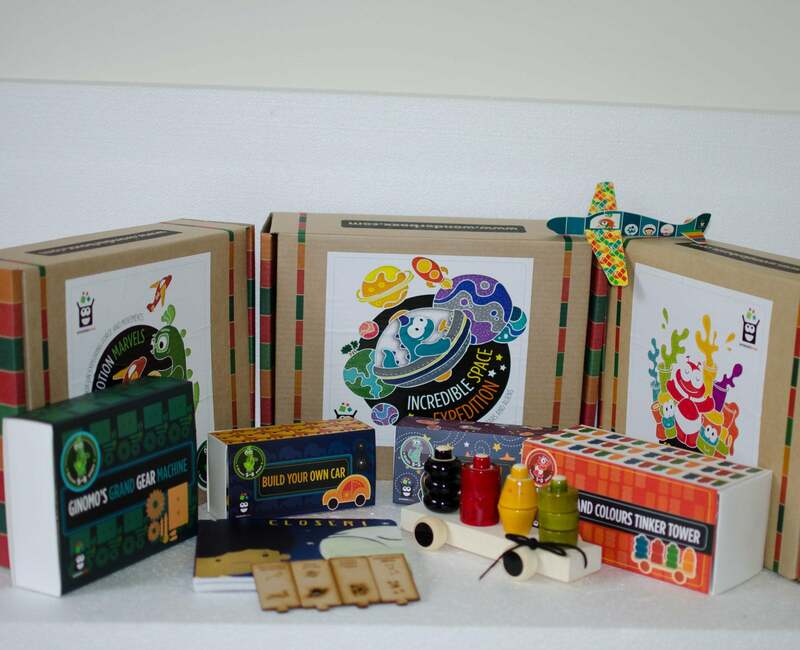 WonderBoxx is designed to provide children with adequate context that encourages their exploration, inquiry and action. It follows different guiding philosophies for kids at different age. The first finished product was developed in nearly four months. “We started the process of developing our fun boxes around November 2014, but before that, we actually went down for product development. Me and my co-founder have spent about 3 months in different schools in a bid to get clarity on the likes and dislikes of the children of different age group. So, those 3 months between august to october were primly spent on the research part. It took us nearly 4 months to design first set of box, however, now we make it in about two and half to three months,” notes the proud Co- Founder. Currently, they offer boxes in three different categories, designed to target age-specific content. The tiny toddlers: This one is for kids between 1 to 3 years of age. The boxes for this age group are designed to spark imaginative and constructive play. The preschoolers: It’s for kids between age-group of 3 to 5 years. The boxes for this age group are designed to inspire, explore, create and learning. The little explorers: This belongs to children between 5 to 8 years of age. The boxes for this age group are designed for a child to lead innovation and discovery. “We currently offer boxes for three different age groups that is one to three years, three to five years and five to eight years. For each of these age groups, we’ve designed age specific content,” says Arora. The bootstrapped startup has made about Rs12- 13 lakh in the project since its conceptualization till date. Initially, the investment was utilized on product development and conducting research in different parts of the country. Presently, the product could be subscribed by the customers for a certain period of either one, three, six or twelve months. “We give our customers option to either subscribe for one month where they can try out one box and if they like it, they can extend the subscription for three months, six months or even for twelve months. They can also avail discount on it, if they subscribe it for a longer period,” notes Arora. Significantly, the price of the WonderBoxx, when we compared to other players dealing in the same sector, is slightly high. On which, Arora explains, “If you want to compare our prices than compare to Flintobox (priced around Rs1,100 a box) we priced our product between Rs 1,300 to Rs 1,500 a box which is slightly expensive than Flintobox. But, the product which we create is of much higher utility and quality is far better in comparison with the other existing players in the market.” Currently, the startups are selling 35-40 boxes every day. What makes WonderBoxx unique from the other upcoming or even existing innovations in the category is the amount of research involved in creating this masterpiece, age-specific options on offer and its exclusive design, which makes it a strong competition. Though, they have received an over whelming response from the market till date, still, the biggest challenge pertains to create and continue creating innovative products on monthly basis. “The response that we have gotten from the market is much better than what we’ve expected. We have anticipated that we would need to spend considerable amount of time in educating people about subscription model and utility of subscribing to such things, but the response is really over whelming, so on that front, to be very frank, we have not face much of a challenge. The challenge is to create and keep on creating innovative product on month-on- month basis, which is the real challenge at present,” says Arora. WonderBoxx products are designed to encourage creativity and pique curiosity in the little ones. “At WonderBoxx, we basically want to be the most innovative players, not just in India, but across the globe. We are creating innovative products to help kids learn, and that is the ethos that we have started with and want to grow into. The idea is to keep on creating innovative products on month-on-month basis and if that is happening, then financial growth and everything else will happen on its own. By the end of this year, we want to reach at a stage, where, we are selling around 5,000 to 7,000 boxes every month,” says the CEO.